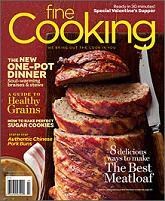 Fine Cooking (Stephanie) - I enjoy looking through the pages of Fine Cooking in part because each issue offers a particular dish with recipe alternatives. The February/March issue includes meatloaf variations with aromatics, meats, mix-ins and herbs and spices ideas so you can create your own recipe. 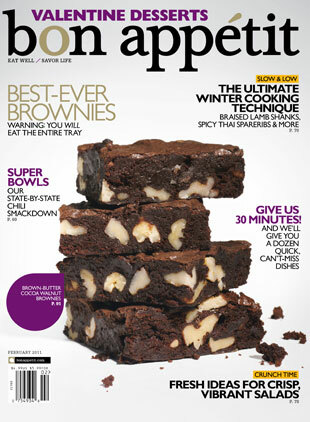 This issue also features several recipes using the banana, including Thai-Style Halibut Banana Curry with Peanuts and Banana Split Brownies. I chose to try the Lemon-Glazed Banana Scones with Crystallized Ginger. I have to admit the flavor combination sounded strange, but nevertheless, intriguing. Also for true confession, I used powdered ginger because I wasn't willing to send $8 on a jar of crystallized ginger for this recipe (conversion: 1/8 tsp of powdered ginger added in with the dry ingredients), so the ginger flavor is most likely less aggressive than the original recipe. Regardless, these are fantastic! I was amazed by the way the banana and lemon complemented each other. Position the rack in the top third of the oven and heat the oven to 375°F. Stack two rimmed baking sheets and line the top one with parchment. In a large bowl, whisk the flour, sugar, baking powder, lemon zest, and salt. With your fingers, rub the butter into the flour mixture until a few pea-size lumps remain. Stir in the banana and the ginger. Add the cream; with a fork, gradually stir until the mixture just comes together. Turn the dough onto a lightly floured surface and pat gently into a 7-inch circle about 1-inch thick. Using a knife, cut the dough into 8 wedges. Transfer to the baking sheet, spacing the wedges 1-2 inches apart. Brush the tops with heavy cream and sprinkle liberally with sanding sugar (optional). Bake until the tops are golden, 19-25 minutes, rotating halfway through baking for even browning. 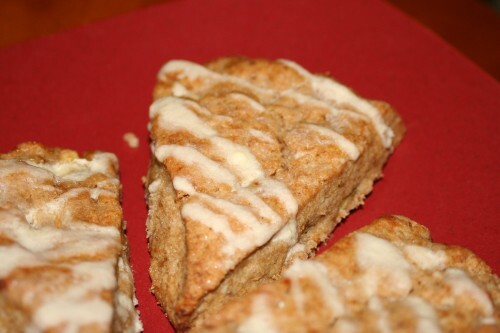 Transfer the scones to a wire rack and cool slightly, 3-4 minutes. In a small bowl, stir the confectioners' sugar, lemon juice, butter, and salt until smooth. Drizzle the warm scones with the glaze. Serve warm or at room temperature. Put eggs into a 4-qt. pot of water and bring to a boil. Remove pan from heat, cover, and let sit 15 minutes. Drain eggs and crack each shell slightly. Transfer eggs to a bowl of ice water and let cool. Peel eggs. Halve each egg; using a small spoon, transfer yolks to a medium bowl. Using a fork, mash yolks. Add cheddar, mayonnaise, 3/4 of the chopped bacon, and bacon fat; season with salt and pepper. Stir vigorously with spatula until smooth. Transfer mixture to a plastic bag or a piping bag fitted with a smooth tip and pipe into egg whites. 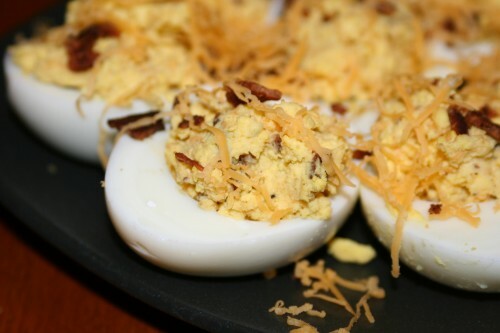 Garnish eggs with the remaining bacon, more cheddar, and hot sauce and serve cold or at room temperature. 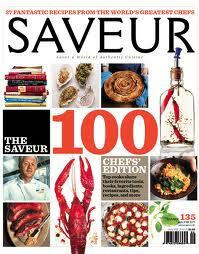 ...Just look at the cover of this magazine. Yum. 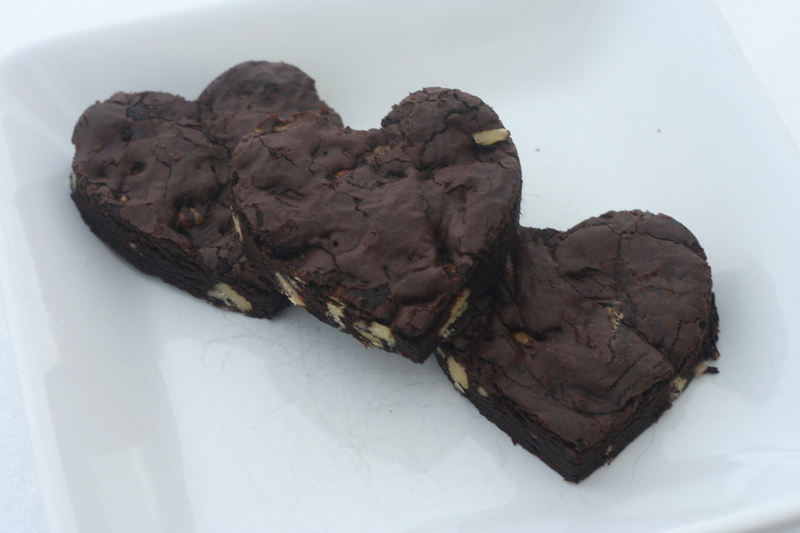 And with a boast of them being the best brownies ever and that you would want to eat the entire pan, well, I simply had to try them. Not that I needed them, mind you - it was all in the interest of kitchen research, of course. :) The verdict: I DID want to eat the whole pan but I restrained myself. Despite my adding way too much flour, they turned out simply delicious. I think the combination of the browned butter, walnuts, and rich chocolatey goodness made them irresistable. [On a side note, I used dark chocolate cocoa powder.] These would be an excellent Valentine's Dessert if you are cooking dinner for two. You could use a cookie cutter to cut them into hearts and serve them with ice cream or fresh whipped cream or all by themselves. Seriously good, folks. Make them. Those brownies look and sound fantastic & I'm going to have to try them. If you're near a Trader Joe's, they have crystallized ginger in bags with their other dried fruit and it is significantly less than those little bottles the grocery store stocks with the spices. I refuse to pay $8 a bottle too, but regularly buy it at Trader Joe's. Although I don't remember the exact price, it didn't give me a shock like the grocery store's price did. And it is so worth it - the flavor improvement over dried ginger is vast.